Imagine being part of a global community that is divided by language. That’s the reality of those of part of the African Diaspora. We are scattered across the globe and, although we look alike, we often can’t even communicate with one another due to the language barrier. But what if you could break that barrier down? What if you could reach people that look just like you? What if you could enter their world, a completely different lifestyle and on a completely different life path from what you’re used to and bond? That’s what Bill was able to do with Spanish. Being fluent in Spanish has allowed him to break down the barrier of language and connect our global community in different countries. Read on to find out how he learned Spanish and was able to connect with the community. Bill: My name is W. Bill Smith, I’m African American and I was born and raised in Brooklyn, New York. My native language is English. I am a retired workforce development professional where I helped job seekers overcome barriers to employment and compete successfully in a competitive job market. Currently, I am a certified professional résumé writer. I help people with great barriers to employment, such as prior criminal convictions, homelessness, long stretches of unemployment, welfare to compete successfully in the job market. I also am the creator of African American – Latino World, a blog where I chronicle my lifetime exposure to the Spanish language and various Latin American cultures with a focus on its African heritage. For years, I’ve been an avid salsa dancer and love and appreciate music from various parts of Latin America. In addition, I achieved the highest award in Toastmasters International, Distinguished Toastmaster (DTM) having won multiple public speaking contests over the years. BGLL: With such a love for the Spanish language, I take it that Spanish is another language that you speak? Do you speak any others? How did you get started on them? Bill: I speak Spanish, some Russian, and can meet & greet in Arabic, French, French Creole, Amharic, Tigrinya, Tagaolog (Filipino), and Mandarin. I self-taught myself Spanish. Thanks to all my Puerto Rican neighbors while growing up near Spanish Harlem in New York City, it’s my favorite language. As far as the others, when I’m around a certain number of people frequently who speak a certain language, I want to learn some of it. For example, when I lived in Oakland, CA where there are Ethiopian and Eritrean communities, I frequent their restaurants and start picking up on the languages. BGLL: What opportunities have you been able to take advantage of due to your language knowledge? 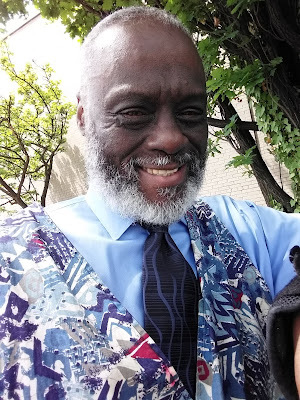 Bill: Thus far, I’ve traveled to nine Spanish-speaking countries including Cuba, Ecuador, Colombia and Perú, making every effort to connect with their black communities and experience, first hand, the black experience in their respective countries. I connect with them by taking part in their social activities and cultural events. BGLL: What three tips would you offer to those who want to become fluent in other languages? Bill: Get the basics; vocabulary and grammar. Take a vacation in the country of interest and enroll in a language immersion school where your instructors speak no English, nor your tutors or your host family. Read Spanish literature and watch movies with subtitles. BGLL: Where can we find you to learn more about what you’re doing? Bill: Log into my blog, African American – Latino World, I also can be found on Facebook both under the name W. Bill Smith. And with my fan page, named after my blog African American –Latino World.